Marimolin’s debut recording (GM 2023), produced by Gunther Schuller and Lyle Mays, was named “Classical CD of the Month” in CD Review with perfect ratings for performance and sound quality. 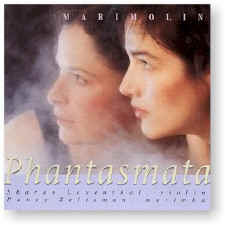 Now, from one of the most adventurous groups in contemporary music, comes Phantasmata. Phantasmata features eight world premieres from the elite of today’s contemporary composers, performances that breathtakingly negotiate every compositional curve, clear every technical hurdle and reveal more of the seemingly endless possibilities of this unique violin/marimba duo. Through grants, commissions and one-of-a-kind programming and promotion, Marimolin has single-handedly built the entire existing repertoire for their instrumentation. In the process, marimbist Nancy Zeltsman and violinist Sharan Leventhal have also forged individual reputations at the top of their fields. Recorded in September 1993, August 1994 and January 1995 at Taplin Auditorium in Fine Hall at Princeton University in Princeton, New Jersey.